Alex Schachinger took one step closer to furthering his soccer career. The Long Island Soccer Club forward was part of a select group of high school players who participated in the eighth annual Executive Cup College Showcase on Saturday, July 21, at Cantiague Park in Hicksville, N.Y.
Schachinger, who plays for the LISC 2002 boys team, was able to showcase his talents and skills in front of college coaches in the hopes of continuing his playing career at the next level. Schachinger currently attends Lynbrook Senior High School. The out-and-out striker utilizes a combination of foot skills, physical strength, and technical awareness on the field. While goals are typically the measuring stick for strikers, Schachinger also values his performances based on his other contributions, including winning headers or causing issues for opposing teams’ defenders. 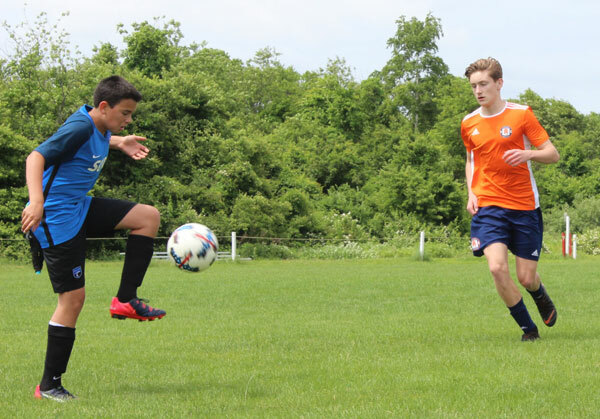 This year’s Executive Cup began with a series of open tryouts in June. If selected, a player would be eligible to participate in the Executive Cup College Showcase. In the past seven years, the event has produced more than 200 success stories with student-athletes going on to represent colleges and universities including: University of Delaware, Princeton University, Emory University, and Massachusetts Institute of Technology (MIT).